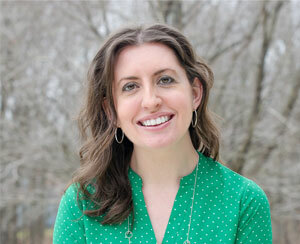 I don't know how many of you read Miss Mustard Seed's blog, but I am inspired by just about everything she does. Marian is a mother, a wife and has used her God-given talents to become quite an entrepreneur, too. Her blog consists of painted furniture and vintage treasures that she sells, her ever changing home decor, and amazing tips for people who are trying to start their own businesses. We share similar styles and I'm always eager to see what new projects she creates. Years ago, she painted a sign on an antique wooden door that read "Fresh Berries." I recently came across some beaded raspberries that I am going to sell in my store and was inspired to recreate this sign to accompany my display. I didn't have a wooden door, but I did have an old board that I believe may have been an piece of wooden siding. Unlike Miss Mustard Seed's board which was stained wood, my board's a light teal color. 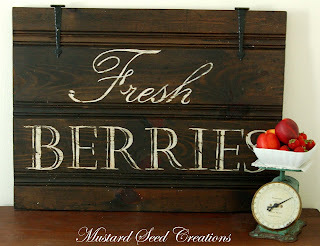 I wrote "Fresh Berries" on the sign, rubbed the entire piece with some wax (so the paint would sand off easily later) and hand-painted the words using an antique white color paint. Using a fine grit sand paper, I rubbed it over the painted words when they were dry to give the piece a distressed look. Since I wanted the board to be worn around the edges, too, and sanding wasn't working, I used a putty knife to chip the paint away. There were also a few place on the board that I chipped the paint off. After sealing the piece with a satin varnish, I brushed on some antiquing medium and wiped it off with a damp rag. In addition to my beaded raspberries, there is also a vintage scale in the vignette. The scale is pretty rusty, so it also has been coated with satin varnish to protect the surface that it is sitting on. So, what do you think of my Miss Mustard Seed inspired display?